Over the years, one of the ways we’ve been able to let people know what we are doing, is through a regular article in the Tetbury Advertiser - a free monthly magazine (excluding August & January) published by The Lions Club of Tetbury. For 12 years Liz Farnham, now a former member of Tetbury in Bloom, wrote every one of the articles, but in December 2018 she, and her husband Kevin, who also designed and created this website, decided to retire from the organisation. However, both the articles and website still continue, now written and updated by Sue Hirst, Tetbury in Bloom’s team leader. Hover over the Newsletters button on the left to find previous years’ articles. 2019 articles are shown below with the latest on top …. Despite the recent cold weather, we’ve still managed to get out twice nearly every week, to tend the beds and catch up on maintenance jobs - clearing leaves, tree debris, weeding and cutting back dead growth, ready for the appearance of thousands of spring bulbs that we’ve planted over the years. Throughout the town, for at least nine months of the year, we’ve made it so there’s always something in flower to complement the colourful foliage shrubs that make up the framework of the displays. Starting in early February with the snowdrops , hellebores and cyclamen, they quickly give way to primroses and crocus. Then come the daffodils which are followed by tulips and alliums. During the summer months, long flowering perennials, bolstered by seasonal bedding take over and towards the end of the year, the late flowering fuchsias and penstemons come into their own by flowering right through to the first frosts in November. Our sole aim has always been to make the town look as attractive as possible, whether we do it by way of flowers or more recently, Christmas lights. Although we don’t compete any more, we still follow the philosophy of RHS Britain in Bloom which is to make the town look cared for and a place where people can be proud to live, work and visit. In December, after 12 years of being members of Tetbury in Bloom, Liz and Kevin Farnham retired from the organisation. It goes without saying that they will be greatly missed – Liz, in her ‘Publicity’ role, having written every one of our Tetbury Advertiser articles since the end of 2006 and Kevin, in his role as our IT expert, photographer and webmaster. We thank them both very much indeed for their input and support over all that time. 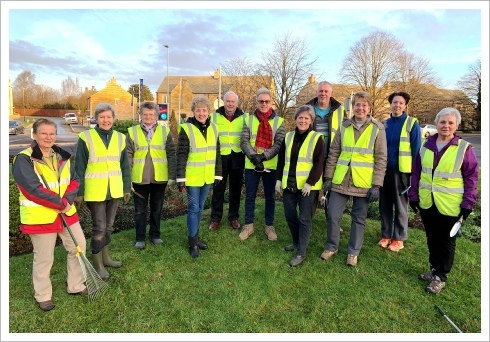 The current Tetbury in Bloom organisation was formed in March 2005 and there are still 4 founder members involved today – myself - I’ve led the team since 2008, organising the twice weekly work parties and designing the flower displays. My husband, Stephen Hirst, who is a town councillor, was the Mayor during those early years and he actually instigated its formation. Each summer he takes on the role of watering the lamppost baskets. Mel Maslin is our long standing Treasurer & together with Ian, her husband, who is also a current town councillor, they both remain much involved especially during the summer planting season. For the first 7 years everyone involved worked relentlessly hard competing in the regional and national ‘In Bloom’ competitions. We were finalists in the national Britain in Bloom campaigns of 2009 and 2011 and achieved our 5th Gold award and were declared Overall Winner in the regional competition of 2010. Although we no longer compete, doing it all for pleasure now, our work over the years has helped make Tetbury become one of the most attractive small towns in the South Cotswolds. With Liz and Kevin retiring, we are now just 11 members strong and of that number, up to 8 of us go out twice a week to tend the flower displays. With February arriving we are already looking toward the summer and taking orders for hanging baskets again! You can choose easy-care, trailing begonias in pink, red and apricot shades OR a colourful mix of vibrant trailing geraniums. They will be delivered to your door by arrangement during the first week in June. 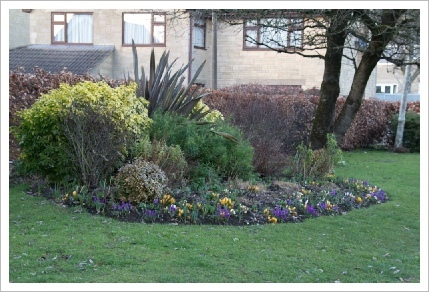 Details can be found in our adjacent advertisement or on our website www.tetburyinbloom.org.uk Profits raised go toward ‘In Bloom’ projects. If you purchased our hanging baskets last summer and still have the empty containers, we’d really appreciate their return as soon as possible please, so we can re-use them for this year. Please give me a call on 504213 to arrange collection.